A type of fruit containing a pit, also referred to as a stone, that does not become attached or cling to the pulpy flesh of the fruit. 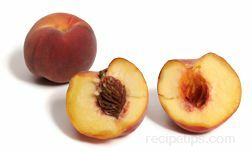 When pits do not cling to the flesh, the fruit is referred to as freestone or semi-freestone fruit, such as freestone peaches. Semi-freestone (a cross of both freestone and clingstone) and freestone fruits slice nicely, unlike clingstone which are best to purée or dice. Therefore, the freestone fruits are best served in appetizer trays, as sliced toppings on desserts, or for other food situations where nicely prepared slices are desired. Some of the most common varieties of freestone peaches include Angelus, Babcock, Bounty, Carnival, Cresthaven, Elberta, Elegant Lady, Fairtime, Fay Elberta, Flavorcrest, Forty Niner, Garnet Beauty, Giant White Babcock, Gleason Elberta, Glohaven, J.H. Hale, Harrow Diamond, Kim Elberta, M.A. Blake, White Nectar, Newhaven, O'Henry, Red Globe, Red Top, Redhaven, Redskin, Regina, Rio Oso Gem, Roza, Sierra Lady, Spring Lady, Sugar Giant, Summerset, Summer Lady, Suncrest, Topaz, and White Lady.